Assist on-site at the Market Square Farmers’ Market on Saturdays, May through November. Duties include set up, break down, staffing our Veggie Valet booth, crowd counting, customer service, and assistance at the information booth. Assist with children’s activities at our Power of Produce Clubs every second Saturday at the Market Square Farmers’ Market. Assist with crowd counting and activities at our Winter Farmers’ Markets, every other week, January through April. After 10 hours, volunteers are invited to our volunteer recognition party. 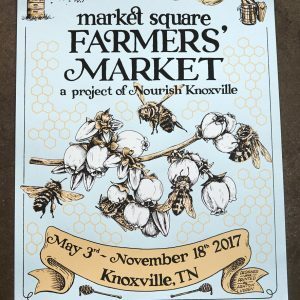 After 25 hours, volunteers are recognized as Friends of Nourish Knoxville. After 35 hours, volunteers can pick out a free MSFM shirt or tank. After 50 hours, volunteers are invited to our Friends and Farmers party. After 75 hours, volunteers receive a special recognition by Nourish Knoxville.